Promyelocytic leukemia protein (PML) is a tumor suppressor that is highly expressed in endothelial cells nonetheless its role in endothelial cell biology remains elusive. Tumor necrosis factor alpha (TNFα) is an important cytokine associated with many inflammation-related diseases. We have previously demonstrated that TNFα induces PML protein accumulation. We hypothesized that PML may play a role in TNFα signaling pathway. To identify potential PML target genes and investigate the putative crosstalk between PML’s function and TNFα signaling in endothelial cells, we carried out a microarray analysis in human primary umbilical endothelial cells (HUVECs). We found that PML and TNFα regulate common and distinct genes involved in a similar spectrum of biological processes, pathways and human diseases. More importantly, we found that PML is required for fine-tuning of TNFα-mediated immune and inflammatory responses. Furthermore, our data suggest that PML and TNFα synergistically regulate cell adhesion by engaging multiple molecular mechanisms. Our biological functional assays exemplified that adhesion of U937 human leukocytes to HUVECs is co-regulated by PML and TNFα signaling. Together, our study identified PML as an essential regulator of TNFα signaling by revealing the crosstalk between PML knockdown-mediated effects and TNFα-elicited signaling, thereby providing novel insights into TNFα signaling in endothelial cells. Promyelocytic leukemia protein (PML) is a tumor suppressor protein, originally identified as a fusion partner of the retinoid acid receptor (RAR) gene characteristic of chromosomal translocation involved in acute promyelocytic leukemia (APL). PML is enriched in distinct nuclear sub-domains known as PML nuclear bodies (NBs) . Hitherto, more than 160 proteins have been reported to constitutively or transiently reside in PML NBs. Recent studies suggest that PML is involved in the regulation of various cellular processes including transcription, cell cycle, post-translational modification, anti-viral responses, DNA damage repair, apoptosis, and cell adhesion in response to extracellular stimuli [2–8]. In addition, studies showed that PML protein accumulation is down-regulated in many cancer types suggesting that PML is a tumor suppressor . A tissue profiling study showed that PML is highly expressed in endothelial cells (ECs) and tissues with inflammation , but its physiological significance in these contexts remains elusive. The tumor necrosis factor alpha (TNFα), secreted by activated immune cells including macrophages during inflammation, elicits a cascade of cellular signaling events in ECs [10–12], such as up-regulation of leukocyte adhesion molecules and increased endothelial permeability. TNFα was initially described as being capable of shrinking tumor size, however later studies suggested that it may stimulate tumor growth by promoting inflammation . Thus, pharmaceutical application of TNFα or TNFα inhibitors in cancer treatment remains debatable . To this end, we have recently investigated the role of PML on angiogenesis in TNFα-stimulated ECs and showed that TNFα induces PML expression and PML is important for TNFα-suppressed angiogenesis [14, 15]. These observations suggest that there may be complex relationship between PML and TNFα signaling. To further dissect the role of PML in ECs and especially in the presence of TNFα signaling, we took an unbiased systematic approach. We knocked down PML by two independent siRNAs with a non-targeting siRNA as control in the presence or absence of a mild dose of TNFα in primary human umbilical vein endothelial cells (HUVEC) and carried out gene expression microarray studies. Following identification of the significantly altered genes, we performed extensive functional analysis and identified an intricate pattern of crosstalk between PML and TNFα signaling. To identify potential PML target genes, we transiently transfected PML targeting siRNAs into HUVECs to knock down PML expression prior to the microarray gene expression analyses. Because siRNAs can have off-target effects, we used two independent PML siRNAs (“siP1” and “siP2”) targeting different regions of PML transcripts with duplicate samples to help eliminate false target genes. We considered a gene to be significantly altered in responsive to PML knockdown if was identified by both siRNAs. Thus, using >1.5 fold and a q < 0.05 as cut-off parameters, we identified 705 genes up-regulated (UP) and 591 genes down-regulated (DOWN) as a result of PML knockdown in the absence of TNFα treatment in HUVECs (Figure 1a, the intersection of both circles, i, designated as “siP.U-siC.U” hereinafter). Using similar parameters, we also identified genes whose expression is significantly altered following 20 h of TNFα treatment in wild type cells (Figure 1b, “siC.T-siC.U”, left circle). Our data show that totally 440 genes were up-regulated, whereas 340 genes were down-regulated in response to TNFα treatment (Figure 1b, left circle). Because TNFα potently induces PML expression [14, 15], we also carried out microarray studies in which PML was knocked down with or without TNFα treatment. When PML was knocked down, TNFα induced 403 genes and repressed 463 genes (Figure 1b, “siP.T-siP.U”, right circle). Among these genes, 270 (UP) and 195 (DOWN) are common TNFα responsive genes, regardless of whether PML was present or not (Figure 1b, the intersection of both circles). We identified 145 (UP) and 211 (DOWN) genes that were responsive to PML knockdown only in the presence of TNFα (Figure 1c, the relative complement of “siP.U-siC.U” in “siP.T-siC.T”). Because of the factorial design of our experiments, we were able to estimate the interaction effects of PML knockdown and TNFα treatment in HUVECs that is designated as siP∗TNF α and calculated as siP∗T = (siP.T−siC.T)−(siP.U−siC.U) or equally siP∗T = (siP.T−siP.U)−(siC.T−siC.U). Similarly as in Figure 1a, we identified 166 such genes by two different siRNAs (“siP1” and “siP2”), of which 58 genes positively responded while 108 genes showed negative interaction effect following PML knockdown and TNFα treatment (Figure 1d, the intersection of both circles, ii). Full gene lists are shown in Additional file 1. Using the genes described in Figure 1, we carried out functional ontology analyses and identified the biological functions significantly affected (q<0.01) by PML knockdown and TNFα treatment through hypergeometric tests using the Gene Ontology (GO) (Figure 2a–c). We found that PML knockdown and TNFα treatment affected a considerable number of common biological functions. The top 25 Gene Ontology Biological Processes (GO.BP) commonly affected by both treatments are listed in Table 1. Specifically both treatments affected various metabolic processes, cell communication, signal transduction, multiple biosynthetic processes, gene expression, transport, and multicellular organismal development. Full lists of significantly affected gene ontology information are found in Additional file 2. Venn diagrams of significantly affected genes. (a) Significantly affected genes following PML knockdown by two independent siRNAs (siP1, siP2) compared to control siRNA (siC) in HUVECs without TNFα treatment. The intersection of both circles (i) is considered significantly affected genes by PML knockdown (designated as “siP.U-siC.U”). (b) Comparison between TNFα responsive genes (“siC.T-siC.U”) and TNFα responsive genes when PML was knocked down (“siP.T-siP.U”). (c) Comparison between PML-knockdown responsive genes in the absence of TNFα treatment (i, “siP.U-siC.U” from a) and in the presence of TNFα treatment (“siP.T-siC.T”). (d) Identification of genes interactively regulated by PML knockdown (two siRNAs, siP1 and siP2) and TNFα treatment. The intersection of both circles (ii) is considered significantly affected interaction genes. Untreated samples, “U”; TNFα treated samples, “T”; comparison between two samples, “-”; interaction effects, “∗”. Numbers in the circles, the number of significantly altered genes (>1.5fold,q < 0.05) by the indicated comparison. Numbers in the outer box, the number of unchanged genes; up-regulation, “up” shown in red; down-regulation, “down” shown in green. We further analyzed significantly altered (q < 0.01) canonical pathways defined by PML knockdown and TNFα treatment using Kyoto Encyclopedia of Genes and Genomes (KEGG) database (Figure 2d). The top 20 (by gene numbers) are shown in Tables 2 and 3. Consistent with the GO.BP analyses, we found that the largest category of genes (n=95) affected by PML knockdown are those involved in metabolic pathways (Table 2). PML is known as a tumor suppressor, and indeed, we identified Pathways in cancer as the second largest affected category of genes (n=39) following its knockdown. Similarly, TNFα treatment showed that Metabolic pathways and Pathways in cancer were the top two affected pathways (Table 3). Our pathway analysis also suggested that PML knockdown and TNFα treatment commonly affected pathways involved in cell communication biological process including Cytokine-cytokine receptor interaction, Focal adhesion, Regulation of actin cytoskeleton, Endocytosis, Tight junction, Chemokine signaling pathway, Cell adhesion molecules (CAMs), Leukocyte transendothelial migration, and Axon guidance (Tables 2 and 3). PML is a well-defined tumor suppressor; however its role in diseases other than cancers has yet to be determined. In addition, it is well known that endothelium actively participates in cardiovascular and chronic inflammation-related diseases. Because PML is highly expressed in ECs and inflamed tissues, we suspect that PML plays a significant role in regulating the EC physiology in the pathogenesis of EC-related diseases. Therefore, we analyzed the significantly altered genes using Disease Ontology Lite (DOLite) database . We found that PML target genes are significantly associated (q < 0.01) with a variety of human diseases (Figure 3). Consistent with its known tumor suppressor role, we identified Cancer as the largest category of disease associated with PML. Specifically, we identified cancers of multiple organ origins to be associated with PML expression including breast, colon, prostate, leukemia, embryoma, liver, lung, brain, melanoma, endometriosis, stomach, and ovarian cancers. We also found PML to be linked to cancer metastasis as identified by an association with Neoplasm metastasis. Interestingly, PML appears to be involved in several metabolism-related diseases and cardiovascular diseases such as Diabetes mellitus, Obesity, Atherosclerosis and Hypertension. PML is also associated with inflammation and auto-immune related diseases including Rheumatoid arthritis, Atherosclerosis, Obesity, Polyarthritis, Asthma, Systemic scleroderma, Ulcerative colitis, Dermatitis. Our data also show that PML is associated with neural system diseases including Alzheimer’s diseases, Schizophrenia and Parkinson’s diseases and embryonic development disease (Congenital abnormality). Consistent with results from GO.BP and KEGG analyses showing that PML and TNFα signaling are involved in a similar spectrum of biological processes and canonical pathways (Figure 2, Tables 2 and 3), TNFα responsive genes are also significantly associated (q < 0.01) with these diseases. 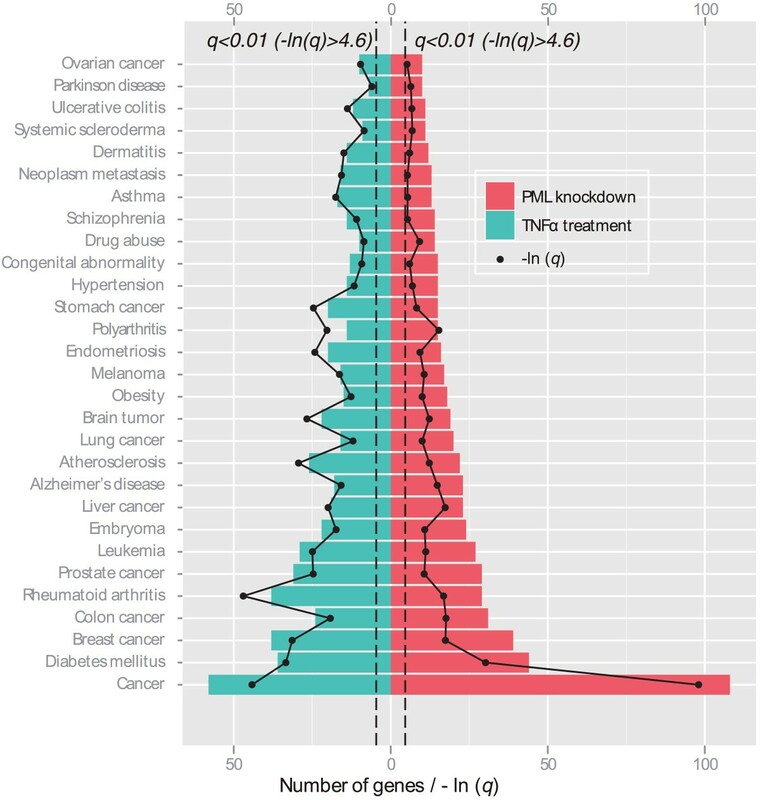 Functional ontology analyses of PML knockdown responsive genes and TNF α treatment affected genes. 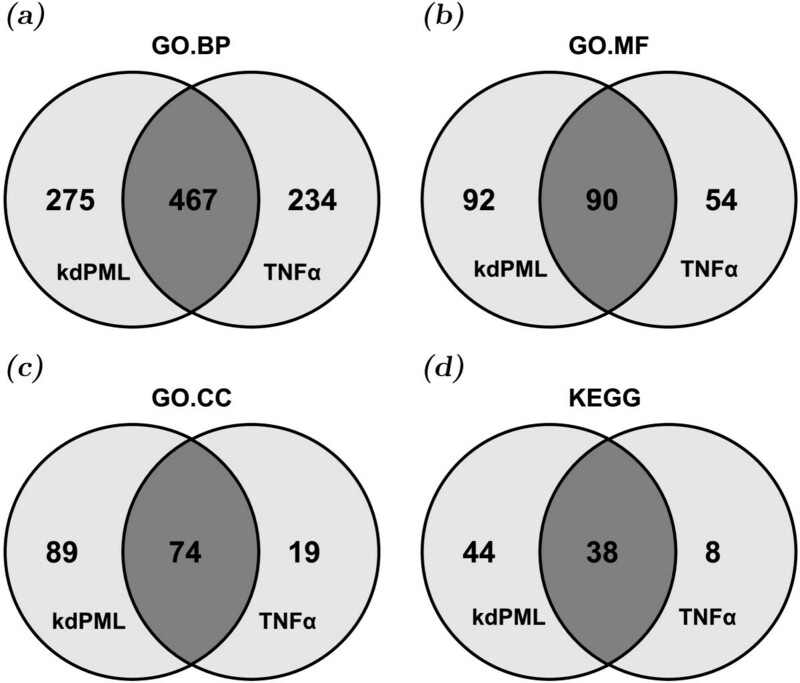 The identified gene lists were analyzed by the Hyper-Geometric test (q < 0.01) as described in Methods to identify the over-represented terms of (a) GO.BP, (b) GO.MF, (c) GO.CC and (d) KEGG pathways affected by PML knockdown (“kdPML”) and TNFα treatment (“TNFα”). Two parental GO terms were removed to reduce redundancy of the GO term definition. GO.BP, Gene Ontology Biological Process; GO.MF, Gene Ontology Molecular Function; GO.CC, Gene Ontology Cellular Component; KEGG, Kyoto Encyclopedia of Genes and Genomes. PML function and TNF α signaling are linked to multiple human diseases. The significantly affected genes by PML knockdown and TNFα signaling are significantly associated (q < 0.01) with multiple human diseases analyzed as described in Methods using a Disease Ontology database. The diseases are sorted vertically according to the number of associated significantly altered genes following PML knockdown. The transformed values (−ln(q value)) of FDR adjusted p value for each category of diseases are shown in the same graph. The dashed lines indicate −ln(q = 0.01) ≈ 4.6. Among the significantly affected genes, we found that a group of class I major histological complex (MHC) human leukocyte antigens (HLAs) were down-regulated by PML knockdown, including HLA-A (5.59 fold), HLA-B (4.71 fold), HLA-C (1.93 fold), HLA-F (1.69 fold), and HLA-G (1.61 fold). Interestingly, this cluster of genes is located on chromosome 6p21.3, a region previously linked to leukemia and other auto-immune diseases [17–22]. Other disease-associated chromosomal regions including 2q36.3–37.1, 6p21.3–22.2, 12q13–14, 12q24.31–33, and 20q11.21–23 also contains PML-knockdown responsive genes and summarized in Table 4. These regions have been previously linked to a variety of human health conditions including multiple cancers, chronic inflammatory diseases, auto-immune diseases, diabetes, cardiovascular disease and developmental defects (Additional file 3: Figure S1). However, the link between PML-regulated gene expression and the disease-associated chromosomal abnormalities is currently unclear. stature, obesity, and characteristic facial features) (Casas et al. Bladder cancer, type II diabetes,myocardial infarction. Given that TNFα potently induces PML expression, we anticipated that TNFα and PML would regulate expression of a common sets of genes and not just common pathways. Indeed, our microarray gene expression analyses show that this is the case. Intriguingly, we also identified a group of genes (n=166) whose expressions were interactively altered when PML was knocked down in the presence of TNFα treatment (Figure 1d). The top 15 such genes and their fold changes are listed in Table 5. Gene ontology information analyses revealed that these genes are involved in KEGG pathways including Metabolic pathways, Cell cycle, p53 signaling pathway, Hematopoietic cell lineage, Apoptosis and immune response-related KEGG pathways such as Cytokine-cytokine receptor interaction, Graft-versus-host disease and Type I diabetes mellitus (Table 6). TNFα is a cytokine that mediates inflammatory response during wounding, chronic inflammation, and bacterial infection. Our findings suggesting that PML is associated with inflammation and auto-immune related diseases implies that PML may actively participated in TNFα-mediated effects in the inflammatory response. To test this, we utilized a cluster analysis combined with the gene functional ontology information (GO and KEGG databases) to examine potential crosstalk between PML and TNFα. We identified two clusters of genes significantly associated (q≦1.03E−3) with inflammation-related ontology information (GO:0006955, GO:0005615, GO:0006954, GO:0008009, GO:0006959, GO:0008083, GO:0009887, GO:0051216 and KEGG pathway Cytokine-cytokine receptor interaction). These genes showed a positive synergistic effect between PML knockdown and TNFα treatment (Figure 4). The interactive effects of PML knockdown on TNF α signaling-induced inflammatory response. (a and b) Two clusters of genes annotated with inflammation-associated ontology information were identified in a clustering analysis of the log fold change values of significantly affected genes combined with their gene ontology information (GO and KEGG). The affected categories of ontology information and the Fisher exact test results are summarized in the table. “CT-CU”, TNFα effects with control siRNA transfection; “PT-PU”, TNFα effects with PML siRNAs transfected; “PU-CU”, PML knockdown effects; “PT-CT”, PML knockdown effects when TNFα treated; “PxT”, the interaction effects of PML knockdown and TNFα treatment defined as P×T = (PT−PU)−(CT−CU)=(PT−CT)−(PU−CU). GO, Gene Ontology database; BP, biological function; CC, cellular component; MF, molecular function; KEGG, Kyoto Encyclopedia of Genes and Genomes. We found that these two clusters of genes are mostly induced by TNFα treatment (Figure 4a–b, columns of “CT-CU”). The NF-κ B pathway is a well-established early activation pathway downstream of TNFα signaling during the inflammatory response. Both of these two clusters contain a large number of genes that are NF-κ B activators or target genes. 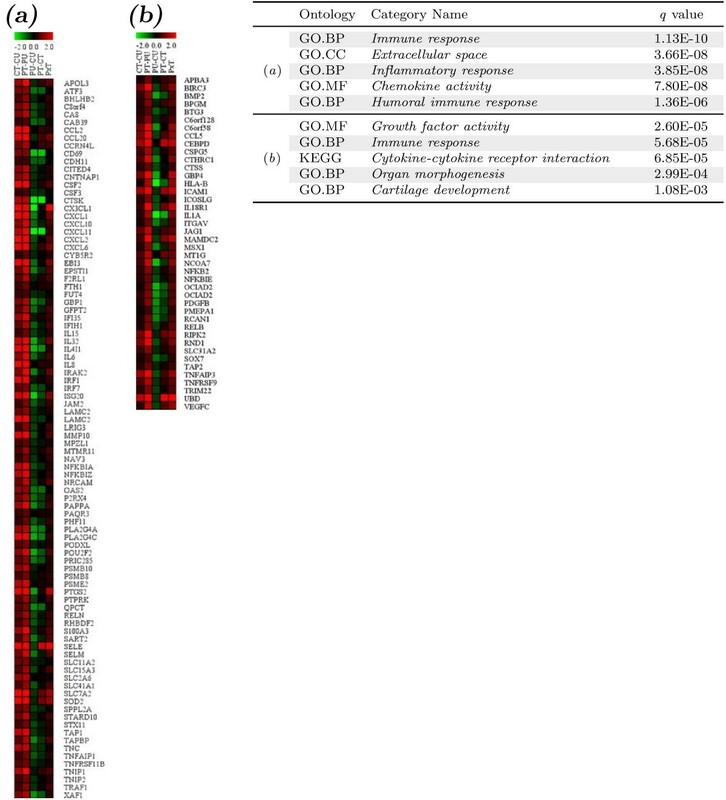 For example, the TNFα induced genes, APOL3, TNFAIP1, TRAF1 are activators of NF-κ B signaling while many other genes are known NF-κ B target genes, such as CCL2, CCL5, CD69, CSF2, CSF3, ICAM1, IL15, IL1A, IL6, IL8, IRF1, IRF7, MMP10, NFKB1A, NFKB1E, NFKB1Z, NFKB2, PDGFB, PTGS2, RELB, SELE, SOD2, TAP1, TNC, TNFAIP1, TNFAIP3, TNFRSF9, TNFRSF11B. Most interestingly, we found that PML is required for the normal expression of these TNFα-induced genes (Figure 4a–b, columns of “PU-CU”) as knockdown of PML decreased expression of these genes. Since members of TNF superfamily and TNF receptor superfamily play pivotal roles in the activation of NF-κ B pathway, we examined the expression of these genes in the microarray and found that PML knockdown did not significantly affect the expression of the TNF gene or its superfamily members TNFSF 7–9, 11–15, and 18, although knockdown of PML did affect expression of TNFSF4 (2.63↑) and TNFSF10 (2.07↓). We also found that knockdown of PML up-regulated a group of TNF receptor superfamily (TNFRSF) members, including TNFRSF1B (2.21 fold), TNFRSF10B (2.49 fold), TNFRSF10D (3.42 fold) and TNFRSF21 (3.62 fold), and down-regulated TNFRSF10A (1.75 fold). Other TNFRSF members 1A, 4, 6B, 7–9, 10A, 10C, 11A, 11B, 12A, 13B, 13C, 14, 17–19, 19L, and 25 were not significantly affected by PML knockdown. To determine the effects of PML knockdown in TNFα signaling, we compared the TNFα effects without and with PML knockdown. We found that the TNFα-induced genes were further up-regulated when PML was knocked down (Figure 4a–b, comparing columns between “PT-PU” and “CT-CU”). 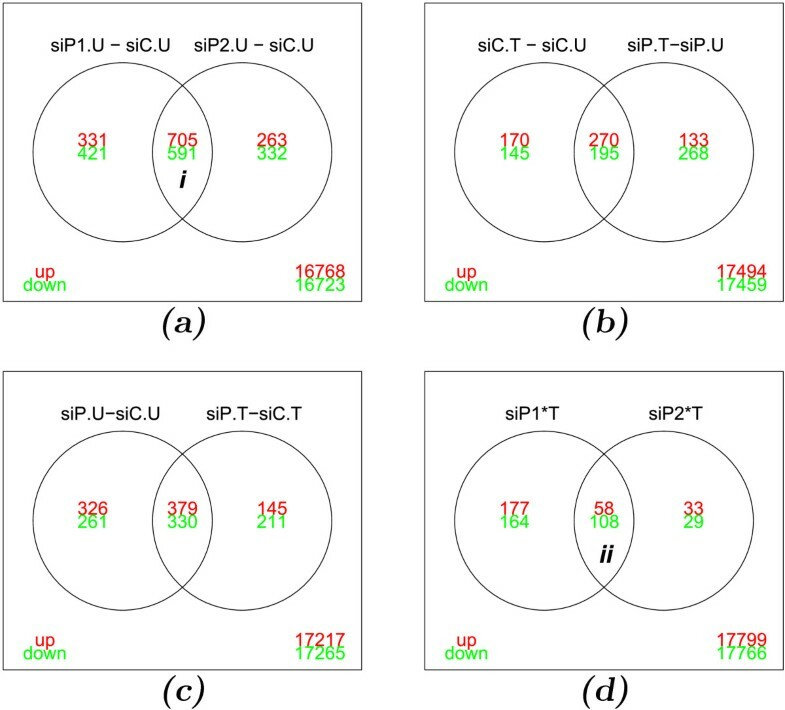 We also examined the effects of TNFα when PML was knocked down and found that TNFα treatment relieved or even reversed the suppression of these clusters of genes by PML knockdown (Figure 4a–b, comparing columns of “PT-CT” and “PU-CU”). Therefore, we conclude that these inflammatory response-related genes are interactively regulated by PML and TNFα in a positive manner (Figure 4a–b, column of “PxT”) and that PML may have effects on NF-κ B activity in TNFα-treated HUVECs. Our GO.BP and KEGG analyses suggest that PML knockdown affected Cell communication processes and the related KEGG pathways. In-depth analyses of the genes altered by PML knockdown showed that PML knockdown interferes with a molecular network of genes involved in the cell adhesion, cytoskeleton, and signaling transduction by extracellular cytokines/chemokines (Additional file 3: Figure S2). Because TNFα is known to activate leukocyte adhesion to endothelial cells during inflammation, we suspect that PML target genes and TNFα responsive genes are involved in a coregulatory network of cell adhesion. Indeed, by hierarchial cluster analysis we found that an array of genes (n=182) involved in cell adhesion pathways show interaction patterns following PML knockdown and TNFα treatment (Figure 5a). We also identified potential regulatory mechanisms of cell adhesion by PML and TNFα signaling through analysis of the sub-clusters of genes in the dendritic tree identified by the hierarchial cluster. We identified 4 sub-clusters of genes that generally represent 4 putative mechanisms by which PML and TNFα regulate HUVEC adhesion pathways. In Figure 5a, the sub-cluster annotated by the blue side bar represents a group of genes that were mostly suppressed by PML (up-regulation by PML knockdown, red in “siP1.U-siC.U” and “siP2.U-siC.U”). However, TNFα treatment had a mixed effects (either up- or down-regulation, red or green in “siC.T-siC.U”) on these genes. The interaction effects (“siP1∗T” and “siP2∗T”) mildly showed green, which indicates that TNFα treatment had negative effects on PML knockdown-induced gene expression. The sub-cluster annotated by the red bar shows a group of genes whose normal expression required PML (down-regulation by PML knockdown, green in “siP1.U-siC.U” and “siP2.U-siC.U”). TNFα treatment suppressed most of these genes (green in “siC.T-siC.U”). For these genes, there was little crosstalk (“siP1∗T” and “siP2∗T” showed mostly black). The sub-cluster annotated by the green bar are genes mostly induced by TNFα treatment (red in “siC.T-siC.U”) but not potently affected by PML knockdown (mildly green or black in “siP1.T-siC.U” and “siP2.T-siC.U”), except a small fraction of genes that require PML for their normal expression (down-regulation by PML knockdown). Although this small fraction of genes was not very responsive to TNFα treatment alone (slightly red in “siC.T-siC.U”), TNFα potently induced the expression of these genes after PML was knocked down (red in “siP1.T-siP1.U” and “siP2.T-siP2.U”). The final sub-cluster annotated by the purple side bar are genes induced by TNFα (red in “siC.T-siC.U”) but suppressed by PML knockdown (green in “siP1.U-siC.U” and “siP2.U-siC.U”). Some of these genes showed positive interaction (red in “siP1∗T” and “siP2∗T”) and others showed negative interaction effects (green in “siP1∗T” and “siP2∗T”) by PML knockdown and TNFα treatment. Taken together, our data indicate that PML and TNFα regulate HUVEC cell adhesion in HUVEC through in an interactive manner by regulating overlapping and distinct groups of genes. One of the key events during leukocyte transendothelial migration is cell adhesion, which we identified as one of the significantly affected pathways by PML knockdown and TNFα treatment (Tables 2 and 3). During the initial stage of leukocyte transendothelial migration, the endothelial cells express cell adhesion molecules to adhere the circulating leukocytes in response to inflammatory cytokines, such as TNFα. To determine whether PML regulates cell adhesion in this process, we carried out an in vitro cell adhesion assay (Figure 5b). We knocked down PML by two different siRNAs in HUVECs followed by treatment with vehicle or TNFα for 4 h. A suspension of fluorescence-labeled human leukocyte U937 cells were added to a monolayer of HUVECs for 30 min. After extensive washing, the adherent cells were quantified by reading the fluorescence signal retained by HUVECs. We found that knockdown of PML modestly increased the U937 adherence to HUVECs in the absence of TNFα treatment (1.62 ± 0.19 fold, p = 0.02 and 1.43 ± 0.11 fold, p = 0.02 for two PML siRNAs, respectively). 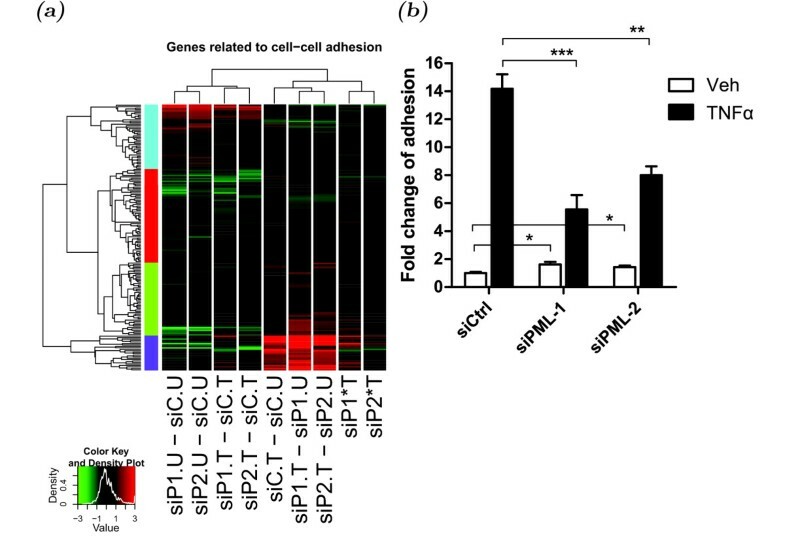 As expected, TNFα potently promoted U937 cell adhesion to HUVECs as shown in control siRNA transfected cells (“siCtrl”, 14.18 ± 1.04 fold, p = 1.52×10−6). Interestingly, knockdown of PML significantly decreased TNFα-mediated induction of cell adhesion (only 5.54 ± 1.03 fold, p = 0.0004 and 8.00 ± 0.62 fold, p = 0.0015 for two PML siRNAs). Taken together, our data demonstrate that PML and TNFα regulates cell adhesion in an interactive manner and that PML is required for maximal TNFα-induced leukocyte adhesion to HUVECs. SiRNA is a commonly used approach to transiently knock down expression from gene of interests to investigate their function. However, some siRNAs have off-target effects. Indeed, our data (Figure 1a) showed that the overlapping affected genes account for 63% and 68% of the total affected genes by two independent PML siRNAs respectively. Our study suggests that careful evaluation of siRNA by using more than one siRNAs is critical for data analysis. Our study found that PML is required for normal expression of a cluster of class I MHC HLAs, including HLA-A, HLA-B, HLA-C, HLA-F, and HLA-G as PML knockdown significantly reduced the expression of these genes. Normal expression of class I HLAs is essential for adaptive immune responses, cytotoxicity-mediated cancer cell removal, and precise modulation of inflammatory responses. Loss or down-regulation of class I MHC HLAs plays a causative role in etiology of these conditions [17–22]. Because PML is down-regulated in many cancers , we suspect the down-regulation of PML and thereby class I MHC HLAs is one of the mechanisms used by cancers to escape the anti-tumor immune response. Thus, PML likely maintains the expression levels of class I HLAs as part of its tumor suppressor activity. Furthermore, class I HLAs are often down-regulated by virus infection , consistent with the notion that PML is an anti-viral protein. Loss of PML may increase the vulnerability to viral infection . Therefore, our analysis suggests that PML is a putative novel regulator of class I HLAs and that PML functions to reduce the susceptibility to cancers and other diseases by controlling expression of downstream target genes, including class I HLAs. Tumors have been known to alter metabolism pattern since the description of the Warburg effect . Recent studies have linked tumors with obesity. Obesity is also a known risk factor for diabetes and cardiovascular diseases. PML is known for its role as a tumor suppressor protein; however its role in metabolism remains largely unexplored. Our data suggest that PML is involved in multiple aspects of cellular metabolic pathways involving macromolecules, biopolymer, nitrogen compounds and nucleotides. As we were preparing our manuscript, it was reported that PML negatively regulates adipogenesis . When our manuscript was under review, we learned that two latest papers reporting PML’s role in cancer metabolism  and stem cell metabolism . Therefore the role of PML in cellular metabolism is an incomplete understood question worth further in-depth investigation. Endothelial cell has significant relevance in angiogenesis, a critical process during embryology, cancer development and cardiovascular diseases. Angiogenesis is a series of multicellular morphological modification involving cell adhesion, migration and differentiation . Chronic inflammation usually promotes angiogenesis [29–32]. Our data show that PML regulates multiple pathways involved in cell adhesion (Table 2 and Figure 5), the inflammatory response following TNFα treatment (Figure 4), and a molecular network of genes involved in cell mobility (Additional file 3: Figure S2). Together, our data suggest that PML is able to regulate several different aspects of angiogenesis. Indeed, PML has been shown to inhibit hypoxia-mediated neoangiogenesis . We have also recently demonstrated that PML is essential for TNFα-mediated inhibition of endothelial cell network formation and migration by regulating downstream target gene expression . We believe that further study on PML and TNFα target genes will shed a light on specific molecular mechanisms of angiogenesis in cancer and human cardiovascular diseases. The effects of PML knockdown and/or TNF α on leukocyte:HUVEC adhesion. (a) Clustering analysis of the log change fold values of the coregulatory network of genes significantly affected by PML knockdown and/or TNFα signaling. Using dynamicTreeCut R package as described in Methods, 4 sub-clusters of significantly altered genes were identified and annotated by color side bars (blue, red, green and purple respectively). Control siRNA, “siC”; two PML siRNAs, “siP1” and “siP2”; vehicle treated samples, “U”; TNFα treated samples, “T”; minus sign of “-”, comparison between two samples; sign of “∗”, interaction effects. (b) Quantification of the adherence of human leukocyte U937 cells on HUVECs transfected with control siRNA (siCtrl) or two independent PML siRNAs (siPML-1 and siPML-2) without or with TNFα treatment. Two-tail unpaired t-tests: ∗, p < 0.05; ∗∗, p < 0.01; ∗∗∗, p < 0.001. TNFα signaling has been well-studied but remains to be fully elucidated. Our study suggests that PML and TNFα signaling regulates genes involved in a similar spectrum of biological processes, molecular functions, cellular components, canonical pathways, and human diseases (Figure 2, Tables 2 and 3, and Figure 3). These analyses suggest that there exists mutual regulatory networks between PML and TNFα signaling. Indeed, we identified a set of NF-κ B-dependent genes that are uniquely regulated by PML and TNFα signaling (Figure 4). We found that knockdown of PML suppressed the expression of these genes in the absence of TNFα treatment but enhanced their expression following TNFα treatment. We hypothesize that PML functions as a molecular switch in TNFα signaling. As such, we reason that the magnitude of PML accumulation following TNFα treatment may have profound effects on TNFα activity and that ablation of PML gene may lead to dysregulation of inflammatory responses. In fact, our microarray analyses demonstrate that knockdown of PML is associated with a network of genes involved in chronic inflammation-related diseases, such as Rheumatoid arthritis and Atherosclerosis (Figure 3). In summary, we have identified the genes induced by TNFα treatment alone, the genes induced only when PML is knocked down and the genes co-regulated by TNFα and PML knockdown. We believe our results provide future directions in the study of PML- and TNFα-coregulated inflammatory responses. Through microarray analyses, we identified novel PML target genes and TNFα responsive genes in HUVEC. Intriguingly, we found that PML is required for normal expression of class I MHC HLAs, thereby suggesting a potential novel mechanism by which PML functions as a tumor suppressor. Our gene ontology information analyses show that PML target genes and TNFα responsive genes participated in a variety of overlapped and distinct biological processes, canonical pathways and human diseases. Notably, we identified clusters of genes implicated in inflammation-related diseases and TNFα-elicited NF-κ B-mediated immune responses that are synergistically regulated by PML knockdown and TNFα treatment. Our data further suggests that PML is a putative novel TNFα regulator, required to finely control TNFα-mediated inflammatory responses. Our study adds to the understanding of TNFα biology and provides novel information for potential pharmaceutical targets in TNFα-related diseases. Through clustering analyses, we noticed that the adhesion-related crosstalk between PML and TNFα engages a complex molecular mechanism. Indeed, our leukocyte adhesion assays demonstrated that the effects of PML knockdown could be switched from activation to inhibition of leukocyte adhesion depending on the presence or absence of TNFα. Together, our results that had not been previously appreciated have uncovered roles of PML and its crosstalk with TNFα signaling. A 3×2 factorial design was adapted. To study PML gene function, we used an siRNA-mediated knockdown approach. The siRNA factor had three levels: control siRNA (siC, no knockdown) and two different PML siRNAs (siP1 and siP2). The two PML siRNAs were used to eliminate off-target effects. TNFα treatment had two levels: no treatment (U) and treatment (T). Each sample had technical duplicates on different microarray chips. To prepare the samples, HUVECs (Lonza, C2519A, passage # < 5) were transfected with a control siRNA (Dharmacon, D-001810-01) or two different PML siRNAs (Dharmacon, J-006547-05 and J-006547-07) for 72 h followed by treatment with vehicle (water) or 20 ng/mL TNFα for 20 h. Total RNA was extracted with a USB PrepEase kit following the manufacturer’s instructions. An aliquot of the total RNA was reverse transcribed into cDNAs and verified by qRT-PCR and gel electrophoresis to ensure that the knockdown efficiency of PML was greater than 75%. The mRNAs were reverse-transcribed into biotin labeled cRNAs with the MessageAMP II kit (Ambion) prior to the microarray hybridization with Human Reference Sequence-8 Version 2 Expression BeadChip (Illumina, HumanRef-8_V2_0_R0_11223162_A). The probe-level raw data with background noise subtracted were used for statistical analyses. The quality controls of our microarray are shown in supplementary data (Additional file 3: Figure S3). The microarray was processed by Genomics Core Facility at Cleveland Clinic Foundation. The background-subtracted raw data is enclosed as Additional file 4. The microarray data were analyzed in the R/Bioconductor environment [34, 35]. Briefly, the raw data were preprocessed with the lumi package [36, 37]. The probe quality was assessed by detection p-values. Those probes with non-significant detection p-values (p > 0.1) in all samples were removed prior to analyses. The data was transformed by a Variance-Stabilizing Transformation (VST) package  and normalized by a Robust Spline Normalization (RSN) package . Using the Linear Models for Microarray Data (LIMMA) package  and empirical Bayes method with the false discovery rate (FDR) adjusted by the Benjamini and Hochberg’s method, we retrieved the significantly changed gene lists (>1.5fold and FDR adjusted p(q) < 0.05). The samples treated by two different PML siRNAs were considered as independent biological samples to retrieve gene lists. The PML knockdown affected gene list was generated by averaging the commonly affected genes by both PML siRNAs. Hierarchical clustering with average linkage was used to for the cluster analysis. Sub-clusters were identified by the dynamicTreeCut R package . For functional ontology analyses, we used the hypergeometric test through the GeneAnswers package . The chromosomal pattern of altered genes were analyzed by MicroArray Chromosome Analysis Tool (MACAT) package . The clustering analyses with ontology information was done by TEASE (Tree-Ease) in the MultiExperiment Viewer (MeV v4.8, an R-based software). The profile of significantly affected genes is shown as a heatmap in supplementary data (Additional file 3: Figure S4). Cell adhesion assays were carried out with an endothelial cell adhesion assay kit (Millipore, ECM645) according to the manufacturer’s instructions. Briefly, HUVECs were transfected with a control non-targeting siRNA or two different PML siRNAs and equally seeded in a 96-well plate until a monolayer of confluent cells was reached. The resulting monolayer of HUVECs were treated with 20 ng/mL TNFα for 4 h, prior to 30-min incubation with U937 human leukocyte cells pre-labeled with Calcein AM®;. The plate was washed extensively and the adherent U937 cells were quantified by reading fluorescence of 485nm/530nm on a microplate reader. XC and H-YK designed the experiments. XC performed the experiments and carried out the microarray statistical analyses. XC and H-YK discussed the data and wrote the manuscript. Both authors read and approved the final manuscript. We thank Dr. David Samols for his comments and Dr. Thomas LaFramboise for his expertise and advice on biostatistics. This work was supported by National Institutes of Health Grants R01 HL093269, DK078965 to H-Y Kao and Pardee foundation to H-Y Kao.